Canmore’s population boom has been mirrored by the construction of new hotels and motels. Most of the newer lodgings are on Bow Valley Trail (Highway 1A). As with all resort towns in the Canadian Rockies, reservations should be made as far in advance as possible in summer. 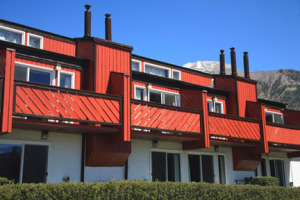 More than 40 bed-and-breakfasts operate in Canmore. They are all small, family-run affairs, with only one or two rooms (a local town bylaw limits the number of guest rooms in private homes to just two). During summer, they fill every night. 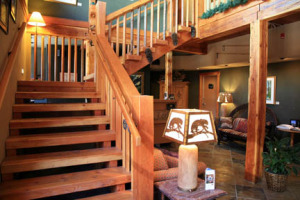 For a full list of B&Bs, check the website of the Canmore/Bow Valley Bed and Breakfast Association (www.bbcanmore.com) for one that suits your needs. As you raise your eyebrows over hotel pricing in Canmore, consider two things: (1) many hotels discount rooms year-round, so use the listed websites to find current deals and packages; and (2) room rates in Canmore are a bargain compared to Banff, just down the road. Outside the busiest summer period (July and August), room rates are slashed considerably (especially at the more-expensive accommodations); with a little bit of searching, expect to find rates that include two lift tickets (at either the Banff or Kananaskis alpine resorts) for the same price as the room-only rate during summer. HI—Canmore is an excellent hostel-style accommodation at the base of Grotto Mountain. Affiliated with Hostelling International, the lodge is part of headquarters for the Alpine Club of Canada, the country’s national mountaineering organization. In addition to sleeping up to 46 people in seven rooms, it has a kitchen, an excellent library, a laundry room, a bar, a sauna, and a lounge area with a fireplace. Rates are $30 per night for members of Hostelling International or the Alpine Club, while everyone else pays $36. Private rooms are $60 s or d for members, $82 for nonmembers. Alpine Club membership is inexpensive and includes a discount at the Lake Louise Alpine Centre. To get there from downtown, follow Bow Valley Trail southeast; it’s signposted to the left, 500 meters (0.3 mile) after passing under the TransCanada Highway. Along the main motel strip, The Hostel Bear is a newer building that originally opened as a motel but has been converted to a beautiful facility for budget travelers. It features eye-catching timber and river-stone styling outside and an impressive lobby. Amenities include a large living area with a a big screen TV and fireplace, a large modern kitchen, a laundry, wireless Internet, and comfortable beds for 170 guests, with configurations ranging from dorms with privacy curtains to private en suite rooms. With a little over $100 budgeted for a room, it’s hard to go past Riverview and Main, centrally located half a block beyond the end of the downtown core. The rooms are decently sized and brightly decorated, and each has access to a deck. The guest lounge centers on a river-stone, wood-burning fireplace. Rates include a selection of hot and cold breakfast items. At the northern edge of Canmore’s downtown core is the Drake Inn. It offers bright and cheerfully decorated motel rooms. Well worth an extra $10 are Creekside Rooms, featuring private balconies overlooking Policeman’s Creek. The adjoining bar opens at 7 a.m. daily for the best-value breakfast in town. Not only can you rent one- and two-bedroom units with full kitchens at Rocky Mountain Ski Lodge , but there’s also plenty of outdoor space for kids to run around, including a small playground. Also on the property is a barbecue and picnic area, a laundry, and wireless Internet. The self-contained suites, some with loft bedrooms, cost from $189. Creekside Country Inn is a modern, mountain-style lodge featuring lots of exposed timber. The 12 rooms are elegant in their simplicity; eight have lofts. Facilities include a lounge with roaring log fire, a small exercise room, a whirlpool, and a steam room. Rates include a gourmet continental breakfast that will set you up for the day. Silver Creek Lodge provides hotel and suite accommodations (one-bedroom with kitchen from $199) within a much larger condominium development. 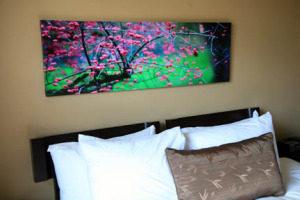 Aside from modern kitchen-equipped rooms, many with mountain views, highlights include the highly recommended Wild Orchid Asian Bistro, spa services, outdoor hot tubs, and underground parking. Lady Macdonald Country Inn exudes a welcoming atmosphere and personalized service not experienced in the larger properties. Its 10 guest rooms are all individually furnished, with the smallest, the Palliser Room, featuring elegant surroundings and a magnificent wrought-iron bed. The largest of the rooms is the Three Sisters, which has bright, welcoming pastel-colored decor; a king bed; two-way gas fireplace; hot tub; and uninterrupted views of its namesake. Rates include a hearty hot breakfast in a country-style breakfast room. Named for one of the valley’s original coal-mining communities, the Georgetown Inn is set up as a country inn of times gone by, complete with a pub-style dining room open daily for breakfast, lunch, and dinner. Each of the 20 guest rooms has its own individual charm, with a modern twist on decor that features lots of English antiques. The best value are the Victoria Rooms, each with a separate sitting area and electric fireplace ($159). With 224 guest rooms, the Coast Hotel is Canmore’s largest accommodation. 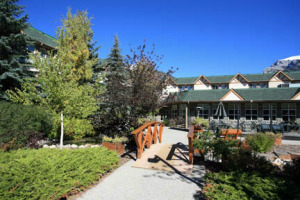 Set around landscaped gardens, this complex also features Canmore’s only steakhouse (the Sunday brunch is one of the best in the valley), an indoor pool, a fitness facility, and a gift shop. Rooms are modern, spacious, and all have large flat-screen TVs and air-conditioning. Steeply discounted off-season rates make the Coast a great deal for nonsummer travel. Paintbox Lodge has the same upscale charm as the Bear and Bison but enjoys a more central location, just one block from the main street. The lobby itself–exposed hand-hewn timbers, slate tiles, and unique pieces of mountain-themed art–is an eye-catching gem. The upscale mountain decor continues through the 10 large guest rooms, each lavishly decorated with muted natural colors and a tasteful selection of heritage artifacts. Rooms also boast beds draped with the finest linens, bathrooms anchored by a deep soaking tub, and wireless Internet. The more-expensive rooms have fireplaces and balconies.